Blackberries are divided into classes by their growth habit and are described as trailing, semi-trailing or erect. The trailing varieties (sometimes called dewberries) are thorny; the semi-trailing varieties are thornless; and the erect varieties may be thorny or thornless. As a rule, the erect varieties are more cold-hardy than the trailing or semi-trailing varieties (see table, next page). Erect varieties also fruit about one month earlier than other varieties. The semi-trailing varieties should be planted 6 to 8 feet apart in the row, with rows 10 feet apart. The trailing types are less vigorous and should be planted about 4 feet apart, with rows 6 to 8 feet apart. Erect varieties are usually established by planting root cuttings. Plant these cuttings about 2 feet apart. Plant blackberries in early spring, about 4 to 6 weeks before the last frost. When planting, make sure the crown is about 2 inches below the soil line. Carefully spread the roots. If there is a portion of an old cane attached as a “handle,” prune that back to 6 inches. When planting root cuttings, place the cuttings in a horizontal position and cover 4 to 6 inches deep in sandy soils or 3 to 4 inches deep in clay soils. Mulch with the material of your choice. Mulch aids in water retention and weed control. Blackberries are quite drought-hardy, but require considerable water during the fruiting period. Apply about 1 inch of water per week by irrigation if rainfall does not meet the need. Fertilize blackberries in early spring when growth starts and again just after harvest. A complete fertilizer such as 10-10-10 is satisfactory. Apply at the rate of 5 pounds per 100 feet of row. A pint of fertilizer weighs about 1 pound. During the first year or two of growth, apply the fertilizer in a 12-inch circle around the plant. On older plants, broadcast the fertilizer down the row. The first step in pruning blackberries is to understand their growth cycle. Blackberries have crowns that produce biennial shoots (live for 2 years, then die). During the first year of growth the shoots are called primocanes. These primocanes develop flower buds the first year of growth. In the second year the shoots are called floricanes. These floricanes produce flowers that mature into fruit. After fruiting these floricanes die and should be removed. Support trailing and semi-trailing varieties by a trellis or similar structure. A two-wire system, with wires at 3- and 5-foot heights, works well. As the shoots emerge in the spring, tie them to the wires in a fan-shaped pattern. Do not top the canes during the growing season. Prune out and discard the old floricanes during the dormant season. It will be obvious which canes are the dead floricanes. Erect varieties do not need support if the primocanes are pruned during the summer to keep the canes from growing more than 3 to 4 feet in height. Train unpruned erect varieties to a one-wire trellis. When the new shoots are 30 to 36 inches tall, cut off the tips to promote branching. Following harvest, cut and remove all floricanes. Continue to tip primocanes at this time. 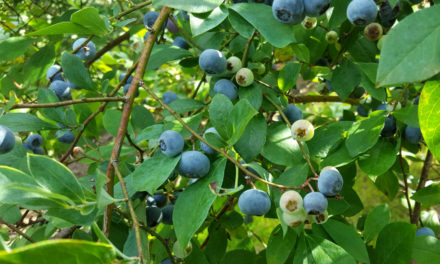 During the winter, prune the laterals to 12 to 14 inches for easier harvesting and larger berries. The berries are ripe and at peak flavor when they begin to lose their glossy shine and turn slightly dull. 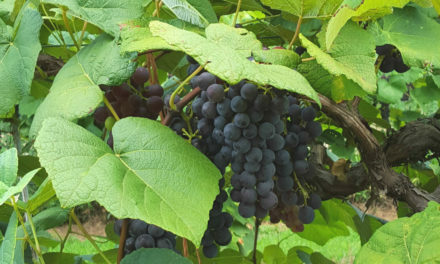 Trailing and semi-trailing varieties begin to ripen in late June in the Piedmont, one to two weeks earlier in coastal areas and one to two weeks later in mountainous areas. Erect varieties are about two weeks earlier than trailing or semi-trailing varieties. Harvest should cover two to three weeks. Insect problems on blackberries are minimal. Pests like aphids, Japanese beetles and spider mites can be controlled on an as-needed basis with general pesticides. Crown borers can be a serious pest. Chemical controls are not available. Diseases include rusts, fruit rot and “double blossom.” Control fruit rots with a sound fungicide program. Rosette, or “double blossom,” is a disease that causes the shoots to have a bushy, broom-shaped appearance on the tips. These shoots produce abnormal blossoms that will not mature to fruit but will produce spores that infect the new primocanes. Again, fungicides can be used in a preventive spray program. If severe infection occurs, summer mowing of all canes down to the ground will reduce infection of later emerging primocanes. Leaf and cane diseases are controlled by the use of copper, lime sulfur or Bordeaux. Apply all chemicals according to directions on the label. Many varieties of blackberries are available to the homeowner. Some of these are listed in the table below. Choctaw All Erect Thorny; early blooming; early ripening cultivar with good flavor; smaller seeds than other varieties; rosette resistance unknown. Brazos SR,CP Erect Thorny; soft fruit yields well in the lower part of SC; very susceptible to rosette disease. Rosborough P,SR,CP Erect Thorny; productive release from Texas; slightly acid fruit; moderately susceptible to rosette disease. Cheyenne All Erect Thorny; slightly tart; very good producer (especially in the lower part of the state); susceptible to rosette disease. Cherokee All Erect Thorny; fairly sweet; good producer (especially in the upper part of the state); very susceptible to rosette disease. Arapaho All Erect Thornless; ripening begins 11 days before Navaho; medium sizefruit; better primocane production than Navaho; disease resistance unknown. Shawnee All Erect Thorny; late blooming and heavy producer; ripens later than most thorny erect types and over a long period of time; very susceptible to rosette disease. Navaho All Erect Thornless; late ripening for erect blackberry; medium size fruit primocane production may be poor; leaf spot problems; very susceptible to orange rust; rosette resistance is good. Kiowa All Erect Thorny; very large and sweet berry; long ripening period; moderately resistant to anthracnose and rust; unknown reaction to rosette. Gem P,SR,CP Semi-trailing Thorny; excellent quality; good producer; resistant to rosette disease. Black Satin All Semi-trailing Thornless; fair quality; good producer. Hull All Semi-trailing Thornless; better quality than Black Satin; ripens late June to early July; vigorous and relatively disease-free.